Ford reported its tenth straight quarterly profit Wednesday but despite that seemingly good news, its stock price fell 6%. Why? The AP reports that it was in large part because the carmaker decided to hold off on reinstating a dividend to stockholders — something we all expected from Ford after statements to that effect earlier this week. Investors were also irked by slowing growth and rising costs in the company's third quarter. Even though Ford earned $1.6 billion and beat expectations, investors wanted to see more the huge gains from 2010, said David Silver, an analyst with Wall Street Strategies. Ford's profit jumped 70% in the third quarter last year, as sales rose sharply from historic lows in 2009 and buyers snapped up new models such as the Fiesta. Autocar reports that next year's Tesla Model S sedan is just the first model planned by the Californian electric car maker in an aggressive vaporware roll-out that includes an all-new Roadster and a range of cars to rival the BMW 3-series. The 5-series-sized Model S will spawn a crossover Model X variant next year, and it's likely to be followed by a convertible in 2013. Tesla CEO Elon Musk also confirmed to Autocar that in 2014 the firm will launch a new Roadster, which will no longer be based on Lotus mechanicals. Although Tesla has made a loss on every Roadster sold, Musk said the car was significant in helping to establish the firm and electric cars in general. "Bob Lutz has said the Roadster prompted General Motors to do the Chevrolet Volt," he said. "We're trying to change the industry." Yeah, good on you to give credit to "Maximum" Bob, but completely ignore the rest of what he says — which is that the "change" is coming from spurring the rest of the industry to act, not to make the damn cars yourself, you fool. 3rd Gear: Scion FR-S Unveiled In Toyota Form? Earlier, we showed you these brochure scans of what appear to be a final production model of the Toyota FT-86 / Scion FR-S may finally show what the real car looks like and end the protracted concept car nightmare parade. Maybe. Sort of. Hopefully. More here. Toyota FT-86: This is it? The Detroit News reports that United Auto Workers leaders confirmed ratification Wednesday of the union's pact with Chrysler Group LLC, despite opposition from a majority of skilled trade workers. In a combined tally, Chrysler's production and skilled trade workers voted 54.8 percent in favor of the contract, which secures work and jobs at Chrysler's U.S. factories, but is far less generous than agreements with General Motors Co. and Ford Motor Co. Automotive News reports that American Suzuki has withdrawn from next month's Los Angeles Auto Show and will again skip the Detroit Auto Show in January. Suzuki had planned to appear at the Los Angeles Auto Show but decided "very recently" to forego the event, said Jeff Holland, spokesman for American Suzuki. Suzuki last appeared at the Detroit show in 2008, Holland said. Suzuki did participate in the Los Angeles show last year. 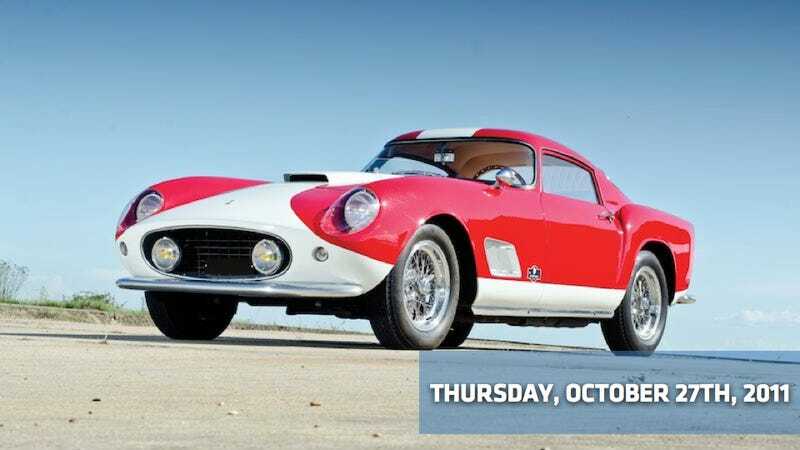 Although a 1958 Ferrari sold for $3.6 million last night as collectors competed for the finest classic cars Bloomberg reports they seemed to pass on others. Three of the top four lots failed to sell at a London RM Auctions event, including another Ferrari, a Lamborghini and an Aston Martin. Is this a softening of the 1%'s love of bidding up the price of classic cars? Find out.